With the testing of professional athletes with the MAZURENKO ARM (Angle Rush Meter) and observations, there are a sufficient number of experimental facts that allow us to assume that slow muscle fibers (SMF) determines the so-called local endurance (LE), allows to postpone the onset of fatigue and accordingly gives to the armwrestler a long time to pull. The ideal way to increase the aerobic power of muscles might be to increase the productivity of SMF. How can this be achieved? In order not to enter into complex aspects of the problem and from a simple article not to do a scientific review, let's look at endurance with the example of two athletes - Devon Larratt (Canada) and Andrey Pushkar (Ukraine) - and try to give practical advice in view of their genetic conditions. Many of you have seen on video how Devon trains and how he improves his skills. The same can be seen about Andrey. It's not a secret that Devon has exceptional endurance and small, in comparison with Andrey, muscle volumes. Is it all about training, or has genetics left its mark on these two athletes? Is it possible to say that Larratt's training is better than that Pushkar’s? I traveled all over the world and met many people. I saw the training of many world champions, America and Europe, but I never saw such a unique athlete as Larratt. Many in Europe, and in the US too, are trained on the basis that strength is first of all. To answer the question of how to train, which technique is better for you, you need to resort to science and know your organism well. If something hurts, then you feel. If you lift more weights from week to week, then you realize that you become stronger. But how to become hardier many of you do not know, and start doing different nonsense in style: "I'll take a little weight and start doing 50 lifts or presses". In this way, you are ruining the all that you have worked hard for a certain time. What we need to know and understand. and much more - that puts us on the path of search, and in fact the biological clock restricts us in time. So do not reinvent the wheel, but follow clear instructions based on scientific rules. We pull with our hands, we have muscles on our hands, we train them, they grow – we understand that. Nobody thought about what kind of muscles we have. And here it is worth remembering a bit about biochemistry and anatomy. Many of you know that the muscles consist of fast and slow muscle fibers. Naturally, only such a division of the muscle fiber is not full, because fast muscle fibers are divided into types I and II (fast glycolytic muscle fibers – FGMF and fast oxidizing FOMF). Slow muscle fibers have a long working capacity due to a large number of mitochondria involved in the resynthesis of ATP. Fast glycolytic muscle fibers are limited only by strength potential and little endurance. And thanks to the II type, the FOMF, in which there is a relative amount of mitochondria, the armwrestler can lead the fight longer than the athlete with FGMF. Our athletes have limited themselves to increasing the power indicators, thereby building their training programs in the light of the development of the FGMF. This way it is really possible to add very quickly in force indicators. But when you begin to understand that you need to develop endurance, you start doing nonsense, which simply kill you, lead to injuries, loss of strength indicators. What changes occur in your muscles during training through the development of FGMF? Any increase in power indicators occurs with the growth of fibers of FGMF. New myofibrils without special preparation are not provided with mitochondria, and accordingly, such a muscle fiber is able to work no more than 10-15 seconds at the limit. After that, there is a refusal, and the fulfillment of any movement is reduced to zero. As a rule, after the achievements of a certain level, you go to competitions, where you realize that you have a lot of strength, but no endurance. Thus, endurance is a priority, and how to achieve a good result in endurance without losing power indicators, almost no one will be able to tell. The problem is that your body did not get the right direction from the very beginning and did not try to rebuild itself during the sports career. I described several cases that appeared in a large number of pullers, for example, in the same Andrey Pushkar. Let's consider another example of a man who has arm muscles built of the predominant majority of slow muscle fibers (SMF). As a rule, in training you do not grow muscles, but you can stomp around the table for hours. Your hands could be almost dead but next day you are ready to pull again. Another problem with which you have to fight - you totally lack a start! Listening to your colleagues, you try under the command "Ready Go!" somehow to train the start, but you still do not get it. In a word, you are wasting your precious time. Holders of this kind of genetic potential can actually do more than that I described above. A typical representative of an athlete who has more slow muscle fibers than fast ones is Devon Larratt. We all saw his training on the Internet, a huge number of exercises performed in the super series. Surely, many of you tried to do the same, and discovered that almost nobody can do it. In fact, both Andrey Pushkar and Devon Larratt found a universal formula for the training process that it is difficult to change, and it is difficult to convince them that they can be even stronger, but they need to start from the beginning. It is clear to us what one and the other athlete has. And what can we advise so that they can progress? There is a certain disproportion in Andrey's results related to the wrist. In the beginning of the 2000s, the weak wrist he compensated with a joint. In 2004, at Europeans in Poland he was seriously injured in a duel with Alexey Voevoda and realized that it was necessary to change the technique, but still his fight was the side. A problem has also appeared with relatively strong muscles of the chest. 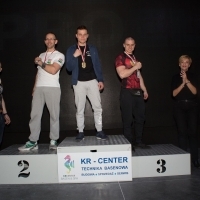 During the fights on the Zloty Tur and Vendetta last year, muscle fibers could not stand the strain and broke. Using a powerful lateral movement, Andrey never learned to bring advantage with the triceps. An example of this – a duel with Todd in 2012. A weak wrist and inability to fight in the triceps decided the outcome of their fight. In my opinion, Andrey does not have enough stamina, and he, first of all, needs to include in his training program static-dynamic exercises on the chest (the exercises for armwrestling, not bench press) triceps and wrist. These groups don’t allow Andrey to fully impose his struggle with peer athletes. A large number of slow muscle fibers give an advantage to Devon to fight with rivals sometimes physically stronger. Using flexible tactics, exhausting tricks over his rivals, he could easily win against such a titan as Pushkar. But the same Pushkar in force opposition was stronger than Devon on the whole head. Devon is one of the favorites in the heavyweight division, but nevertheless the "universal soldier" has its weak points. Despite physical capabilities and endurance, Devon Larratt would advise focusing on strength exercises such as lifting the maximum weights in 4-5 sets of 2-3 repetitions, static-dynamic exercises, and exercises on plyometrics. Devon lacks the kind of strength, so train with big superseries and a lot of repetitions. With so many oxidative muscle fibers, he simply lacks musculature. Irina Driaeva: "I will try to repeat the golden double in Budapest"